ClydeUnion Pumps: As the economic case for companies to focus on core activities becomes increasingly compulsive, the growing trend of businesses sub-contracting their peripheral support services to specialists continues to accelerate. Although many of the world’s largest corporations have long embraced the philosophy of out-sourcing secondary activities, many other businesses are now following suit. An example of the advantages that can be gained through a working relationship are the instrument calibration services provided by Trescal to ClydeUnion Pumps, an SPX Brand. ClydeUnion Pumps is known worldwide for supplying reliable and robust engineered pumping solutions. The company’s high quality products are used globally within many demanding industries, focusing primarily on oil and gas, nuclear and conventional power generation and the desalination sector. ClydeUnion Pumps’ largest manufacturing facility is located in Cathcart, Glasgow. Having repeatedly invested in the best available technology and continually adapted to the needs of its global customer base, the impressive Glasgow facility manufactures a globally renowned range of centrifugal pumps. To help enable the continuation of its excellent reputation for the quality of its output, the Cathcart site uses an extensive range of measuring equipment. As the calibration and maintenance of the facility’s measuring inventory was considered secondary to the company’s core activities, ClydeUnion Pumps awarded a contract for the in-house delivery of measuring equipment calibration services to Trescal. 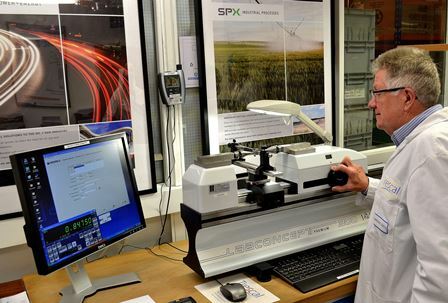 Trescal is Europe’s largest calibration provider and offers an extensive range of test, measuring and repair services. Trescal employs more than 360 people in the UK and has the most extensive range of UKAS accredited technical capabilities. A growing aspect of Trescal’s activities is its custom calibration management service; Equipment Management Solutions (EMS). By the application of EMS, all test & measurement assets of a company are managed by Trescal. EMS is tailored to the specific needs of each client and allows the customer to focus on core business activities. To enable the ClydeUnion Pumps range of instruments to be accurately calibrated on-site, within the required time scales, Trescal uses a newly installed Trimos Labconcept Premium Calibration machine that was purchased from Bowers Group. Garry Clark, Trescal Calibration Laboratory Manager explained: “As Trescal is Europe’s largest provider of calibration services, we have extensive experience with Trimos calibration machines. Having examined the long list of ClydeUnion Pumps’ instruments that needed to be calibrated and the required rapid instrument turnaround, along with the relevant ClydeUnion Pumps’ staff we concluded that the advanced Trimos Labconcept Premium calibration machine had the required accuracy, flexibility and speed of operation. “To enable the efficient operation of the calibration contract we spent time entering the details of all of ClydeUnion Pumps measuring instruments onto the easy to use QMSOFT software package that was supplied with the Trimos machine. In addition to each gauge’s calibration period, usually 6 or 12 months, we also recorded the instruments unique code number and its location. “Now, QMSOFT automatically provides us with a daily list of gauges that are due for calibration and their locations. Having collected the gauges, we then store them in our environmentally controlled room, allowing them to reach the correct temperature for accurate calibration. “As the Trimos Labconcept Premium is able to accommodate the vast majority of ClydeUnion Pumps’ measuring instruments and hard-gauging, for efficiency we usually group similar items together. For instance, when calibrating ring gauges, having mounted the appropriate quick-fit accessories onto the machine, we are able to very quickly and accurately calibrate a whole batch. On completion of any category of gauge, we are then able to quickly fit the relevant accessories to enable the calibration of other kinds of instruments. In addition to the ease of use of the Trimos machine, its ingenious quick-fit accessories enable accurate calibration procedures to be undertaken extremely swiftly. “Although our skilled calibration technicians are familiar with the correct calibration methods for the vast majority of gauges, on the rare occasion that they need help, QMSOFT software is able to guide the operator through the calibration procedures. Alex McLeod, ClydeUnion Pumps Quality Manager added, “Quality is at the heart of all of ClydeUnion Pumps activities, to ensure that we preserve our hard won reputation, we are constantly looking for ways to improve our procedures. Our decision to work together with Trescal on calibration and to invest in a Labconcept Premium Calibration machine has proven extremely successful. As the cooperation we have had from Trescal’s staff has been outstanding, the changeover from in-house calibration services to specialist services has been almost seamless. “In addition, the use of the Trimos machine has also made a vast difference to the efficiency of our calibration operation, through its use we have managed to halve the time that gauges requiring calibration are removed from our production cells,” he said. The Labconcept Premium represents the latest development in the field of multifunction calibration machines. Capable of calibrating an extremely wide range of measuring instruments with remarkable speed and accuracy, the impressive Trimos device is now the calibration machine of choice for some of the largest UKAS laboratories and in-house calibration facilities throughout the UK and other recognised laboratories throughout the world. The machine’s wide range of quick-change, ingenious accessories and holders facilitates the accurate calibration of a extensive range of measuring instruments. Utilising the user-friendly QMSOFT software, the Labconcept Premium can rapidly send its findings to gauge-management software or generate instant calibration certificates.